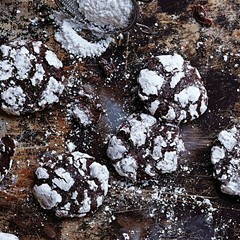 There is a deeply complex science behind cookie baking. Aside from the question of butter versus margarine versus Crisco (butter, always), it's something I never really bothered to consider until a few months ago when I saw it had been given the full J. Kenji López-Alt Food Lab treatment on the website Serious Eats. 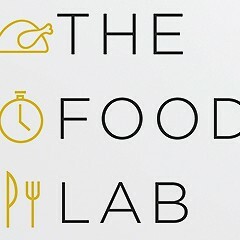 (The Food Lab, for the uninitiated, delves deeper into the science of cooking than you thought anyone would ever want to go. 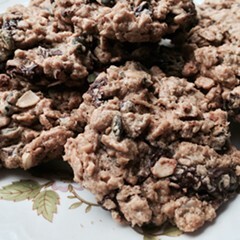 For details, check out Julia Thiel's review of the Food Lab cookbook.) López-Alt considered a full 21 factors that go into the making of a chocolate chip cookie. 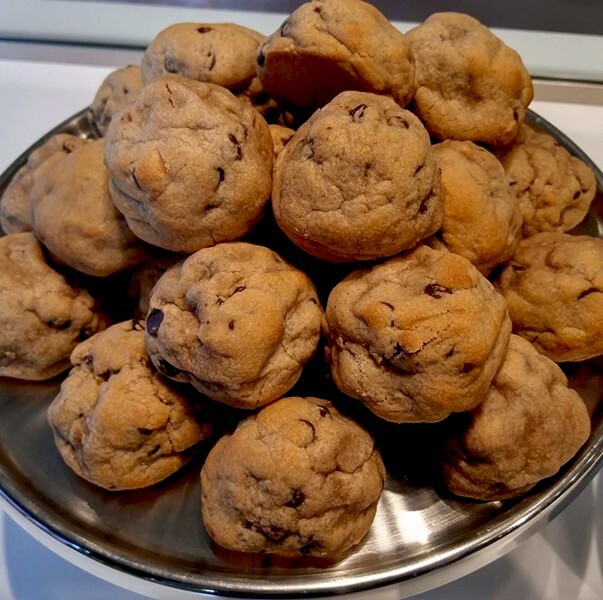 I went back to that article the other day after I visited Warm Belly Bakery and brought a half-dozen cookies back to the office for my coworkers to sample, mostly because the Warm Belly cookies look like no cookies I've ever eaten before. Frankly, they puzzled me. Consider: when you think of a cookie, you think of a crisp, disk-shaped object, good for breaking in half and dunking into a glass of milk. The cookies at Warm Belly Bakery are not like that. They are thick and dense, like hockey pucks. We had to cut them into pieces with a knife. More than one coworker wondered if the cookies had even been baked, or if they were just another excuse to eat raw cookie dough. Not that anyone cared, because raw cookie dough is delicious. From what I can gather based on observation, López-Alt's analysis, and casual conversation with the kid behind the counter at Warm Belly, the cookies look so weird because they're baked just long enough to avoid any risk of salmonella, but not enough to spread out and caramelize and get crispy. (Also maybe because they contain a higher proportion of flour and use baking powder as a leavening agent, per the Food Lab.) The purpose is to keep them soft while they sit out all day, and also, presumably, to produce a cookie that is filling enough to justify the $3 price tag. "It's sort of a cross between a cookie and a scone," the kid behind the counter said. And, indeed, I went into Warm Belly around lunchtime, feeling very hungry. 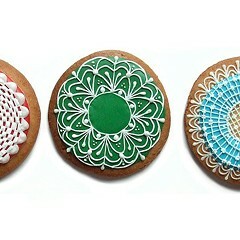 I had a cookie and a cup of coffee and didn't bother with lunch till late afternoon. Several coworkers declared the need to take a nap after finishing their pieces of cookie (no one dared to eat a whole one), though none actually did. And now onto the cookies themselves. Baker Joe Dela Pena has 30 varieties, though only ten or so are available at any given time. They range from the basic—chocolate chip, sugar—to the baroque—s'mores, cereal milk. At the shop, I tried the hazelnut chocolate chip—because if you open a cookie store and screw up chocolate chip, you're really in trouble. Warm Belly did not screw it up. The cookie had a nice butterscotch flavor that paired well with coffee, and there was the right amount of chocolate. Also, it was obvious that it had been made with ingredients found in nature. Since the bakery is right next to the cafe, there was no need to overload the dough with the sort of preservatives that give Mrs. Field's and other commercial cookies such a terrible chemical aftertaste. Of the half-dozen varieties I brought back to the office, my coworkers' favorite was the Mexican hot chocolate, which was fudgy and just spicy enough not to be boring. (It also heated up nicely in the microwave.) The Turbinado sugar cookie wasn't too sweet, but some tasters found it underbaked. The blueberry-lemon-white chocolate was supposed to be lighter, but everyone thought it was very sugary. Nobody could stand more than a sliver of caramel graham cracker, not because it tasted bad, but because it was so rich and sweet. Chocolate chip walnut was just OK. And birthday cake, made even taller by a swirl of frosting with sprinkles (of course! ), looked too terrifying for anyone to attempt. The Warm Belly cafe is a cozy, kid-friendly place with small tables and chairs that plays cozy, kid-friendly music like the Beach Boys and the Beatles; they also provide crayons and paper. 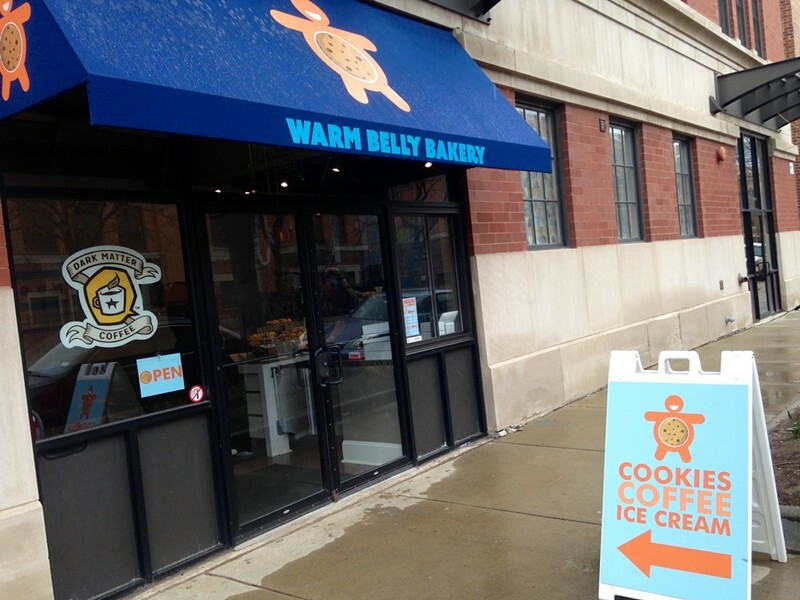 Like Insomnia Cookies, Warm Belly also delivers, to the UIC campus and points in and around the West Loop. It's unclear whether the cookie will replace the doughnut as the city's best pastry trend. I'm inclined to say no, at least if Warm Belly is leading the revolution. I wouldn't turn a cookie down, of course, but given the choice, I'd still rather have a doughnut. In this massive new cookbook, it's the techniques that matter, not the recipes.